As a Haas Door Factory Certified Distributor, Overhead Garage Door, Inc. offers the full line of Haas Door’s quality garage door products and models. Our services include repair, maintenance and garage door installation to the city of Chicago and Chicago suburbs. We are an industry leader and as such, guarantee the highest quality service and best rate pricing. For homeowners looking for the elegance of a traditional carriage door, at a reasonable price point, Haas Door’s American Traditional Series is the solution. The classic style is detailed with wrought iron hardware to enhance the aesthetic. The modern technology and security features are available in 12 door and 10 window design offerings, making this a great choice for home or business owners. Chicago weather can wreak havoc on your home’s exterior. Haas Door offers the Insulated Aluminum 5000 Series, created with durable Aluminum and insulated to help reduce heating and cooling costs in any weather. With a 35-year warranty and 6-year hardware, this series is a perfect for a homeowner seeking value and quality. Haas Door’s Residential Aluminum 360 Series offers a rust and corrosion free option for homeowner’s featuring commercial grade Aluminum. The 360 Series offers custom options like wood grain, painted or anodized finishes and your choice of 15-insulated glass window options. For home and business owners concerned with energy-efficiency, the Insulated Steel 2000 Series offers a commercial grade R-Value and lasting construction. Options like wind load and full thermal break can increase the durability of your Insulated Steel 2000 Series garage door. Featuring embossed wood grain on gauge galvanized steel, the Haas Insulated Steel 700 Series is a perfect option for the home or business owner seeking long-lasting and stylish garage door options. This series defeats industry standards around energy-efficiency and provides a low-maintenance solution for your residential garage door needs. Haas Door’s Insulated Steel 600 Series garage doors offer full thermal break in 21 different color options. The Steel design eliminates worries over cracking, warping or rotting and the lifetime warranty is in place to support the durability of design. Ribbed, raised and sculpted panel options are available on any of the 600 Series garage doors as well. The 2400 Series from Haas Door is a high-quality, low-maintenance line of garage doors. The 18 residential garage door models offer the strength and durability of steel with the customization options to fit your home’s exterior. Similar to Haas Door’s 2400 Series, the 2500 Series offers 25-gauge galvanized steel garage door options. This allows for the same durable make-up and customization, with a slightly lighter garage door overall. This style is also available with Wind Load for increased weather resistance. 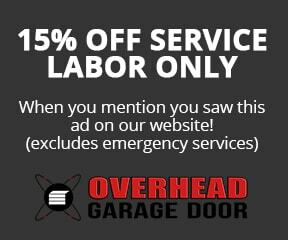 If your home or commercial business is in need of a new garage door or garage door repair, Overhead Garage Door, Inc. can help. As a Haas Door authorized dealer, we can help you customize your Haas Door order and complete the installation for you. Contact us today to schedule your garage door consultation.